BLOG – Who is Flyy Guy Fresh? First show of “Pillow Talking” Tour was SOLD OUT! Flyy Union Entertainment has started curating monthly playlists of the Hottest Hip-Hop & R&B songs from the dopest signed & unsigned artists on Apple Music & Spotify. If you know anyone that may be interested in submitting to the playlist have them follow the FUE instagram page @Fue.Live & direct message or email FUEplaylistsubmissions@gmail.com. This month’s playlist features songs from Offset, Cardi B, Blueface, FUE’s own Flyy Guy Fresh & Rell G, Kehlani, Lil Skies, 2 Chainz & MORE! Stream & add the playlist FUE’s playlist below. 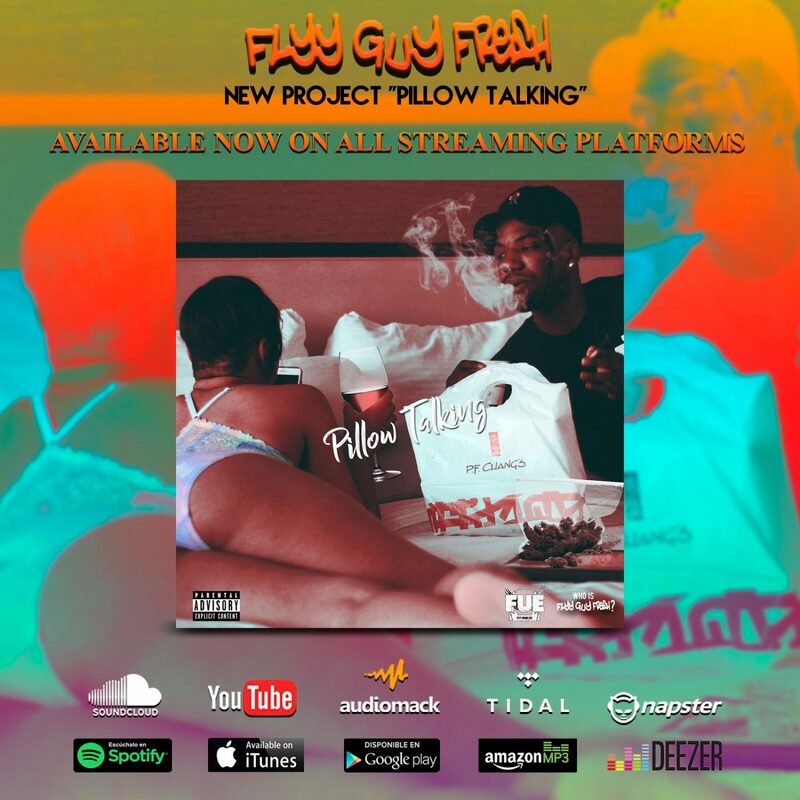 Flyy Guy Fresh’s New project “Pillow Talking” is OUT NOW! Flyy Guy Fresh hasn’t given us a body of work since is his “Still Working” project at the end of 2016. Just three years later you can hear the growth in Flyy Guy. With much more confidence and delivery, “Pillow Talking” shows us just the type of artist and audience Flyy Guy is talking to. With witty and convictive lyrics Flyy Guy taps into his own style of melody and flows like exhibited on “Paper Chasin” & “The Best”. Songs like “Designer & Diamonds” and “No More Love” taps into the more melodic sound of Flyy Guy. Overall this is a sound body of work from one the artist of the future. Check out the project below. Back in Nov 2018 Korean Hip Hop artist Broken Lips enlisted Harlem’s Flyy Guy for his “Look at Me Now” record and months later they give us the video. Directed by Ty Vision & Flyy Union Films, Flyy Guy takes Broken Lips to his neighbor of downtown Harlem. check it out video and you can also stream the record on Spotify, Apple Music, Tidal, Soundcloud & all major streaming platforms.